The Atrium and upper floors of the hospital display artwork on a longer term basis; these are generally obtained by donation, commission or long term loan and are also available for sale. These include the internal and external courtyards throughout the hospital which showcase a range of 3-Dimensional pieces so that a glance outside the building is as engaging as walking around inside. In addition to the public areas, we sell and arrange commission of artwork for display in wards and departments. Our aim is to ensure that the quality of artwork and framing throughout the Trust is of a consistent high quality. We rarely buy artwork for public spaces, saving money for the Trust whilst keeping the displays fresh and dynamic. At any one time the total value of artwork on display in public areas is around £200,000, providing a substantial asset for the hospital and all who enjoy the pieces. Bath Artist Printmakers are a group who work together as a co-operative in Larkhall, Bath. Their workshop in Upper Lambridge Street provides facilities for all kinds of printmaking techniques including etching, woodcut, linocut and basic screen printing. The exhibition at the RUH displays a cross section of members’ work produced at their workshop. 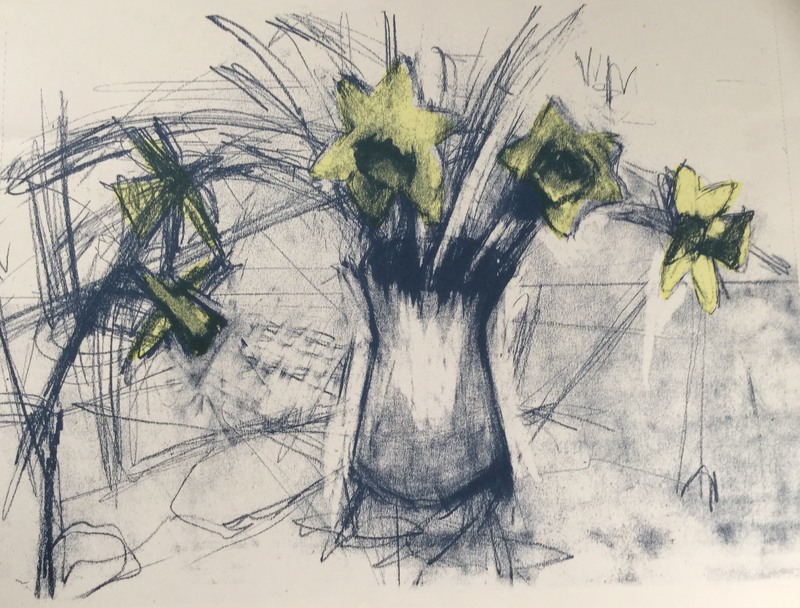 Bath Artist Printmakers provide courses for anyone interested in learning about printmaking. Please see www.bathartistprintmakers.co.uk for more details. They also hold open days and exhibitions at the workshop throughout the year and welcome visitors to view members’ work. Bath Artist Printmakers have been a part of the cultural life of the city since its foundation in 1984. Their purpose then, and still is, to provide studio space and facilities for artists to further develop their skills as printmakers and to promote awareness of the techniques involved through exhibitions and courses. As an art form printmaking is often misunderstood. Unlike Giclee prints and other commercial methods of reprographics every aspect of an artists print involves the physical input of its creator. Every mark on the plate is applied by hand. Inks are rolled, spread and wiped by hand. The prints are pulled, one by one, through the presses by hand and the editions rarely exceed fifty. So, in this age of digital reproduction we are trying to preserve many of the working practices that have changed little since Rembrandts day and to encourage others to explore the infinite possibilities within the context of contemporary art. Art at the Heart is pleased to present a new exhibition by popular Bath artist, Nick Cudworth who has a permanent display space at the Royal United Hospital. The new exhibition is a further celebration of Bath and the surrounding area. This includes the series of Littleton Wood Barns in 4 seasons, painted from the same view point and a selection of 4 White Horses from the Nine White Horse series. The white horses on Alton Barnes, Devizes, Cherhill and Hackpen can be seen side by side in this exhibition. Devizes (1999) the most recent of the White Horses, carved in celebration of the Millennium. Located on Roundway Hill, overlooking the village of Roundway – this is the only Horse in Wiltshire to be facing to the right. Some of the Wiltshire White Horses date back 250 years and eight Wiltshire White Horses still remain on view today. Celia draws with wire, as others draw with pencil. Birds are her main inspiration; capturing their movement and character is her primary concern. She finds that wire has a spontaneity that can give her sculptures a feeling of life and energy. The sculpture above the Atrium Coffee Bar is the work of Bath artist Edwina Bridgeman and was financed by the South West Arts Lottery Programme. The sculpture shows a group of people in a huge wooden boat, sailing across the sky and sea, complete with fish and seabirds, and even a ship’s cat. Providing entertainment, as well as being uplifting, the piece is a symbol of hope for visitors, patients and staff to enjoy. Individuals will have their own ideas of what this sculpture means to them. Edwina Bridgeman believes that the theme reflects our experiences in life. We all make journeys – tiny ones and huge ones – because of course life itself is a journey. The boat and figures are made from recycled materials. Much of the wood comes from the banks of the Thames where the river had washed it up and other materials from the beach. By imposing a restricted timescale on himself, and the presence of an audience, Sebastian wanted to explore what would happen when he dramatically changed his working dynamic by taking himself out of the cosy, reflective environment of a personal studio. The result is a calming yet energetic artwork, well suited to a hospital environment, which hangs now hangs permanently in the main atrium of the RUH. Anna Simmons has painted Three Views of Wiltshire including: Roundway Hill near Devizes, Martinsell Hill near Calne and Woodborough Hill near Woodborough. This is a long term loan from Dr Carol Peden; she bought all three paintings for the RUH collection in memory of her husband Robin Smith, who was Consultant Surgeon at the RUH for 20 years. Martyn Colbeck has a passion for African elephants and has spent literally thousands of hours in their company documenting intimate moments in their lives. As well as making several award-winning films for the BBC Martyn has also recorded the lives of these fascinating animals on stills film. This stunning exhibition features a selection of 50 fine art black and white photographs of elephants taken in Amboseli National Park, Southern Kenya. The collection is an attempt to convey something of the majesty, sensitivity and complexity of these extraordinary animals. Martyn is a former overall winner of the Wildlife Photographer of the Year Competition and two of the photographs featured in this exhibition were winner and runner-up in the Black and White category of the 2005 Competition. For over 20 years he has been documenting the lives of one family of elephants in Amboseli National Park, Kenya. Together with elephantscientist Cynthia Moss, Martyn has made three films for the BBC’s world-renowned Natural History Unit in Bristol following the day to day lives of an elephant matriarch, known as Echo, and her family. These highly acclaimed films, known as the “Echo of the Elephants” trilogy, follow Echo as she guides her extended family through crises,including droughts and the birth of her own crippled calf. Donated funds by The Friends of the RUH commissioned a series of artwork that would create a new identity for the restaurant, and this was followed through in our branding for the menus and signage. Staff from the Lansdown Restaurant and the Friends of the RUH helped to select the successful artist, Nicky Dupays, who designed a series of collaged artworks were scanned on to large sheets of Perspex to create four main pieces. Also incorporated into the design was a set of photographs by Anna Proctor, which shared the same theme of food and travel. Howard Hodgkin is one of Britain’s most important painters and printmakers. Born in London in 1932, he studied at the Camberwell School of Art between 1949-50, followed by the Bath Academy of Art between 1950-1954. He has served as a trustee of both the Tate Gallery and the National Gallery, London and in 1992 he was knighted for his services to the arts. Hodgkin’s paintings and prints often refer to memories and private experiences, but deliberately avoid the illustrational. Though his works often appear spontaneous, they are often the result of an extensive process of layering and over-painting. Since the 1950s, he has made a substantial number of original prints and, over the last twenty years has favored the use of etching and aquatint combined with hand-painting. In 1985, Hodgkin won the Turner Prize and represented Britain in the Venice Biennale. His work has been the subject of numerous major retrospectives most notably at the Metropolitan Museum, New York in 1995 and more recently, in 2006, at the Tate Gallery, London, The Irish Museum of Modern Art, Dublin and the Reina Sofia, Madrid. His paintings and prints are held by most major museums including MoMA, NY, Tate Gallery, London, Metropolitan Museum, NY, British Museum, London, Carnegie Institute, Pennsylvania and Louisiana, Denmark. Basketball Player is a tubular steel and board sculpture that depicts the moment of high action. Art at the Heart supports the RUH Bath with an award winning art and design programme that stimulates healing and well-being and creates an uplifting environment for patients, visitors and staff. We embrace the non-institutional, patient-centred and art-rich approach, reaching on average 200,000 people per year through exhibitions, workshops, performances and design.